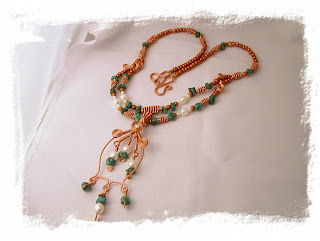 Copper wire, coil beads... large white freshwater pearls, turquoise nuggets and copper color e beads. I originally made this for a sister for Christmas, but I kept having doubts as to whether it was something she would like or wear..so I made her something else... and I was right as when I visited her for a Christmas get together I wore it my self and it got no comments from her at all... and since she holds to the conviction of if you have nothing nice to say, say nothing... I was at least relieved that I had made the right choice in gifting her with something else.. and now I can enjoy it!